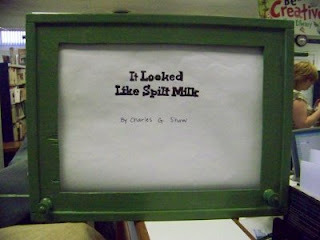 I made my first scroll story earlier this summer, a version of It Looked Like Spilt Milk by Charles G. Shaw. 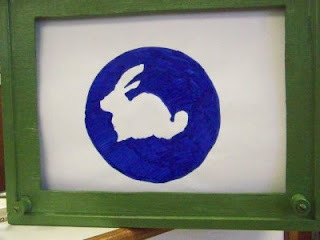 I know lots of children's librarians use Shaw's story as a felt/flannel board. Other stories that you might have used as felt stories will probably work well as a scroll story too. Here are some steps for creating a scroll story of your very own! * Harold & The Purple Crayon by Crockett Johnson. 2. Write a script for the story, as you won't want to try and manipulate the dowels in the story box at the same time as you are reading the picture book. Build the story box. You will need four dowels (2 skinny and 2 fatter ones), and some plywood to frame the box. I also recommend screwing a handle into the top to make carrying the box easier. You will need to drill 4 holes in the left and right sides for the dowels. The skinny ones will be closest to the screen and hold the story straight and the thicker ones in the back are the dowels the story is wound on. Mine almost looks like it was fashioned out of a wood filing cabinet, if that gives you a good visual. I repainted the one I found in storage with some leftover paint, so that is why it is hardly a perfect paint job. 4*. Using fadeless paper, prepare the paper for the story to be drawn. Buying a 50-foot long roll of paper gave me enough paper to create two stories. You will most likely need to trim some of the width off to fit your box. 5*. Mark out the dimensions for each picture (I think of them as "slides".) For example, the size of my screen is about 15" wide and 11.5" high. I also left a 2" gap in between frames or slides of my story so that both pictures would not be visible to the audience at the same time. This also heightens the dramatic effect. 6. Once areas are marked off, draw your story! Have fun! 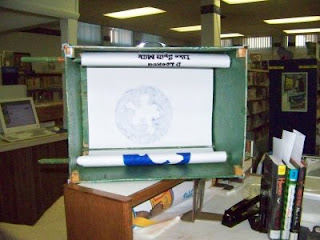 *Make sure you have plenty of room to unroll the paper to measure, cut, and draw! If anyone has suggestions for a scroll story that they'd like to see, let me know! I am itching to use my other thing of paper!